Summer’s not over yet, so that means I’m still happily swimming in salads. 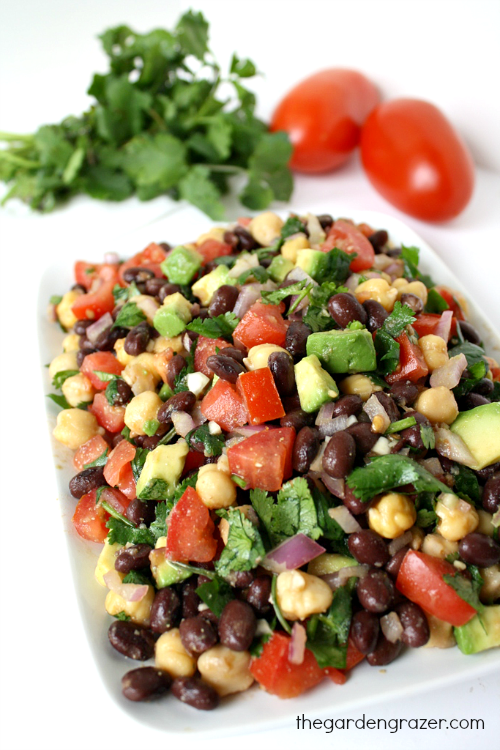 Like this Fiesta Bean Salad! It’s hearty with a nice protein boost from all the beans. 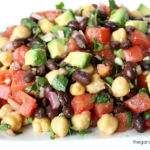 Garbanzos and black beans are my two favorites, so I love them joining forces in the same dish. I’ve always been a huge fan of the cumin-lime-garlic combination and it’s the perfect way to make this salad shine. Can’t go wrong with southwestern flavors! 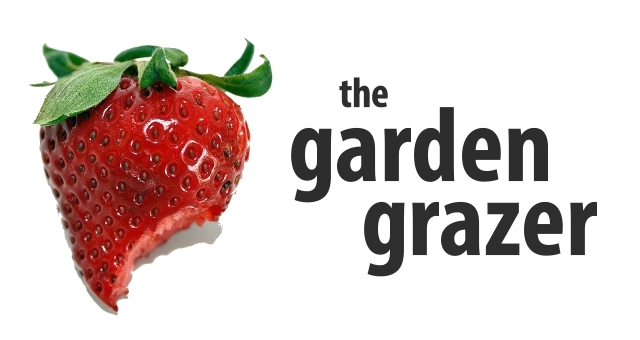 This is definitely a great choice for packed lunches and BBQ’s/picnics as well. 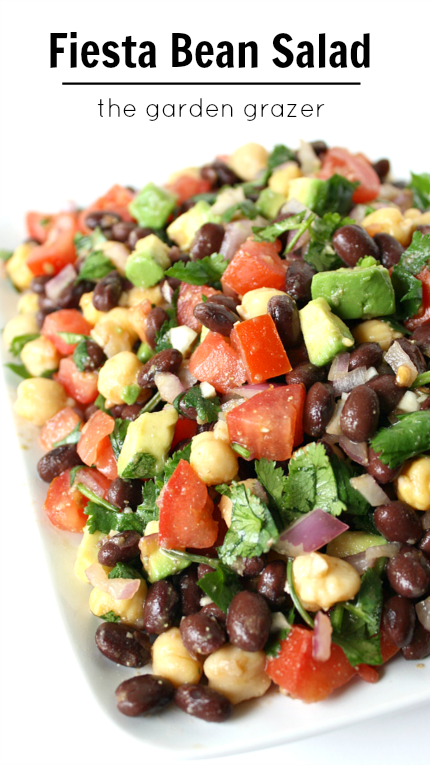 Fiesta bean salad with cumin-lime dressing! 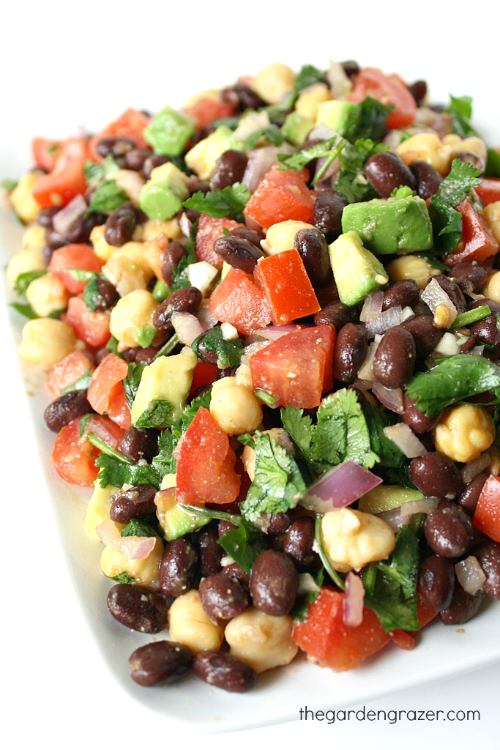 Fresh, healthy, and made with two delicious varieties of beans! Can serve 6-8 as a small side. Omit oil in dressing for oil-free version. this looks so good, i can just taste it! mmm! 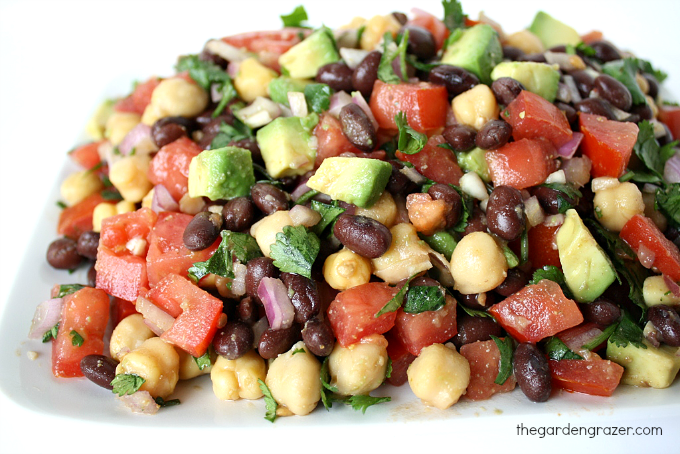 Very colorful and summery salad. Yum! Hi Ania! Yay! Happy to hear you enjoyed it. A little extra lime juice never hurts 😉 Once in a while I get less-juicy ones too! Hi, how many serves would this make please? Hi Leanne! This makes about 4 1/2 cups, so it's around 4-5 servings. It could serve more if portions are small. Hope that helps! Simply perfect. I'm super picky with my food, so this is definitely a keeper! Will it good with tortilla chips? Looks delicious. Can you recommend an alternative to olive oil to make it oil free? If serving it the next day, would you add the dressing the next day? Hi! You could do either 🙂 If making the day before, I might suggest making the salad and dressing, leaving them separate, then tossing together an hour before serving. It would be a little fresher that way, but you could certainly mix them together the day before and let it marinate more. I would definitely wait to add the avocado right before serving however, so it's fresh and no browning 🙂 Hope you enjoy!! Thanks so much! Tried it for a large group and it was a hit! Will be my go to salad now! Awesome!! So fun to hear it was enjoyed at your get-together – thanks for sharing 🙂 Hope you have a great weekend!